April 11, 2016 – Today, our time machine will wend its way through the tight mountain passes of Southern France, and across the blue seas of the Mediterranean to the principality of Monaco. Yes, Monaco. The name itself conjures up images of glamour and gambling, of royalty and race cars. But how did it get that way? It’s about half the size of Central Park, the second-tiniest nation in the world. Yet it’s played a big role as a destination of gambling and vice for the world’s rich and famous. 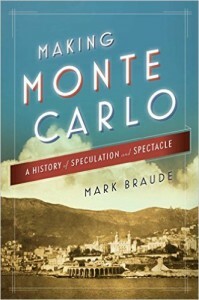 Dealing the cards today is Mark Braude, who sends us on our way with his debut book: Making Monte Carlo: A History of Speculation and Spectacle . Mark is a lecturer in history at Stanford University, having earned a Ph. D. in Modern European History from the University of Southern California, as well as a Masters in French Studies from our own New York University.